General Qamar Bajwa‘s “pro-democracy credentials” and his low profile influenced Pakistan Prime Minister Nawaz Sharif to appoint him to the powerful post of army chief superseding four top generals, Pakistani media and experts commented on Sunday. 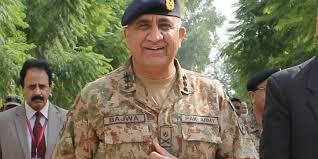 “A careful review of General Bajwa’s profile clearly reflects that his pro-democracy credentials earned him the post of Chief of Army Staff,” leading Pakistani newspaper The News commented, a day after Prime Minister Sharif appointed Gen Bajwa to succeed Gen Raheel Sharif as the army chief. The media commented that Prime Minister Sharif wanted to appoint an army chief who should be military expert as well as backing democracy in the Islamic nation. The military has been in charge of the country for more than half of Pakistan’s nearly 70-year history since independence from Britain. “All the four generals being considered for the post of COAS were passed out from military academy on the same day but undoubtedly General Bajwa has an experience more diversified than all others. General Bajwa’s caliber, credentials, experience and holding the biggest core also helped him to be appointed the Chief of Army Staff,” the report said. Under the watch of the outgoing army chief Sharif, the civil-military balance of power had titled more in military’s favour, the report said. With his elevation as army chief, Gen Bajwa has now superseded Lt Gen Syed Wajid Hussain (chairman of Heavy Industries Taxila), Lt Gen Najibullah Khan (DG Joint Staff Headquarters), Lt Gen Ishfaq Nadeem Ahmed (Corps Commander Multan) and Lt Gen Javed Iqbal Ramday (Corps Commander Bahawalpur). Dawn also said that Prime Minister Sharif named the new military command, appointing Gen Bajwa and Gen Zubair Mahmood Hayat as the Chief of Army Staff (COAS) and the Chairman of the Joint Chiefs of Staff Committee (CJCSC), respectively, in the hope of stabilising the fragile civil-military balance. While the office of CJCSC is technically the more senior position — as he serves as the principal military adviser to the prime minister and the National Command Authority (NCA) — the office of army chief is the most prized and arguably the most powerful position in the country, the paper said. Bajwa, an infantry officer, has commanded the famed 10 Corps, the army’s largest, which is responsible for guarding the area along the Line of Control (LoC) with India. Bajwa is the fourth officer from the infantry’s Baloch Regiment to become the army chief. Before him, Gen Yahya Khan, Gen Aslam Beg and Gen Kayani rose to that position. Meanwhile, PML-N Senator, Lt General (Retired) Abdul Qayyum said there was no difference in the credentials of all the four generals who were considered for the top slot in army. However it was prime minister’s discretion to appoint anyone among the four candidates. “Prime Minister definitely wanted an army chief who is supportive of democratic system in the country, who believes in the supremacy of Parliament and who could work for the betterment of the country. “These were the major points what I believe the prime minister would have taken into consideration before appointing the COAS. I believe General Qamar Bajwa possesses all these elements due to which he has been given the top slot in Pakistan Army,” Gen Qayyum told The News. To a question about General Bajwa’s positive role in the 2014 anti-government sit in, he said he was not sure about any such information however if he had played a positive role, it was his duty as they took oath to protect the Constitution of Pakistan. On Prime Minister Sharif’s decision to supersede four generals, Gen Qayyum said it was prime minister’s prerogative. “The premier wanted an all rounder for the top slot in Pakistan Army who could not only run the institution of Pak Army but his relation with the civil government was also important,” he said. Former Corp Commander Karachi Lieutenant General (Retired) Sajjad Ghani said there was no major difference in the credentials of the four candidates for the top slot. However it was up to the prime minister’s discretion who saw his suitability in terms of working relations with the civilian government. Therefore, he said this was not a surprise for those who were aware of the system of Pakistan Army. Meanwhile, the Prime Minister’s office last night, in a press statement, confirmed the two key military appointments. “At the advice of Prime Minister Nawaz Sharif, President Mamnoon Hussain approved promotions of Lt Gen Zubair Mahmood Hayat and Lt Gen Qamar Javed Bajwa to the rank of Generals. After promotion, General Zubair Mahmood Hayat has been appointed as Chairman Joint Chiefs of Staff Committee and General Qamar Javed Bajwa has been appointed as Chief of the Army Staff,” a press release said. Bajwa will take charge of the world’s sixth-largest army by troop numbers in a formal handover on Tuesday, when General Raheel formally retires. Later, the army chief designate called on the prime minister and discussed various issues with him.